For those of you who are my seven regular readers of domesticat.net, this post isn't for you; this post is a rehash of some previous posts, plus photos, for the Quilt Bloggers' Festival. It's for a lot of people who didn't see this little quilt while it was in progress. Did you spot it? It looks different, but did you figure out why? 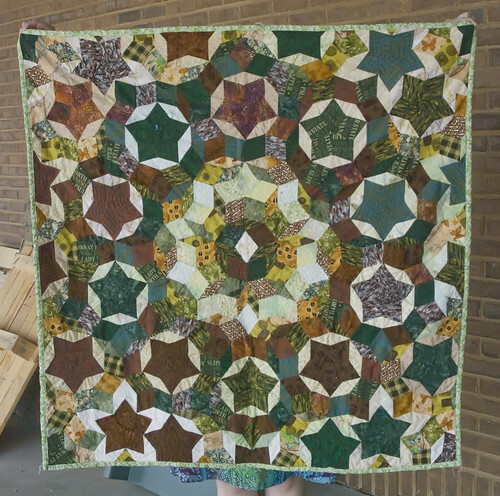 This quilt is a Penrose tiling [wikipedia entry], the variant known as a cartwheel. Penrose tilings are named after Sir Roger Penrose, who generally got the 'Sir' because of this very discovery in mathematics. 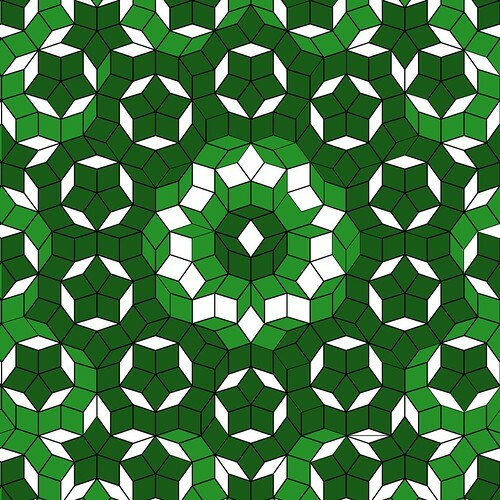 There had been a question in geometry for a long time: anyone who has ever looked at a bathroom floor or a subway wall knows it is possible to create 'periodic' tilings, that is, tilings that repeat over and over again. But what about the opposite? Was it possible to have a set of tiles that only tiled aperiodically, meaning they never had a full repeat across a flat surface? How many points do each of the stars have? Yes. Five. Find the center point of the tiling and let your eyes flow upward and outward. The pattern opens up -- and then fractures. Look further out, and you'll see that it opens up and fractures again. It will do this again and again as the pattern grows larger and larger, but this central motif that you see here? It will never appear in its entirety ever again in the entire tiling. You could take it to infinity and it would simply never happen. but due to the number of friends' babies born this year, and a few surprise quilts along the way, it is still waiting in the wings. It will be tackled in 2011. I hadn't planned on making this quilt, but let's just say a need arose. There is a woman up in Manitoba whom I've never met, but through random chance and happenstance has been reading domesticat.net for many years. She knew that I'd had my tubes tied in my late 20s, and contacted me when she was thinking about having the same procedure done, herself. She also pinged me early this year, in shock, when she discovered that -- even though she'd had the same surgery -- she was pregnant. What to do, what to do? All I can say is this, to little baby Fiona, who is now a couple of weeks old: you SO OWE YOUR MOM. When Amanda told me she was pregnant, the idea of doing a baby Penrose immediately came to mind. Such a special and unique pattern for a special and unique situation -- plus a chance to dig through my stash and practice this pattern before I applied it to a much bigger quilt. If you're curious to see all the in-production photos, I'd encourage you to take a look at http://domesticat.net/quilts/penmanship -- it details the quilt from start to finish. That page has a link to this photoset on flickr which has even more photos that aren't in the original entry. The blog entry for Pentatonic is at http://domesticat.net/quilts/pentatonic and its photos, what few there are, exist at this flickr photoset. The obvious thanks would go out to Roger Penrose, but there's one less obvious one -- Dr. Alan Schoen. He's a retired professor, living in Illinois, who has rendered out a lot of these tilings in vector formats that Adobe Illustrator can read. It has meant that many of the more interesting mathematical tilings are available to me as homegrown quilt patterns. My friend Jacob, however, has learned nothing from these exploits and continues to entice me with new patterns. Are you a little fearless? Interested in a challenge? Interested in making a quilt that really doesn't look like everything else under the sun? I have the tilings in a graphical format that can be resized infinitely. If you are interested in tackling this pattern, and you're willing to be patient with someone whose full-time job keeps her away from her hobbies for longer than she'd like, then contact me -- use the contact form at http://domesticat.net/contact -- and let me know what size quilt you're interested in tackling. I'll be happy to resize the pattern and send you something workable. http://domesticat.net/quilts -- all of the quilts I'm working on. 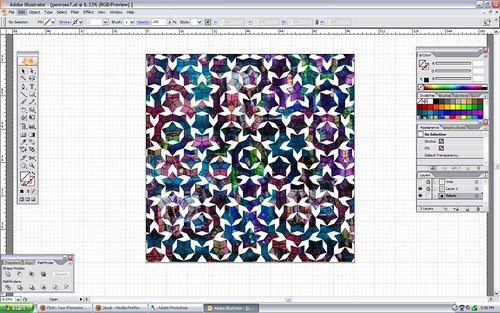 http://domesticat.net/quilts/rss -- an RSS feed of just my quilts, or blog posts about the subject. Then there's the Quiltifesto, a rant on what I'm doing, why, and how. Let's just say it's slightly opinionated. I spotted it was a penrose deflation in the thumbnail! *g* Mostly b/c I have a small one in progress myself and I agree they are not the easiest things to piece--but such fun!! I really like the way you've used the colour effect to add extra life and flow to the pattern. The one graphed out in 'screenshot in white' fairly glows--I look forward to seeing that completed one day. How impressive! I've taken more workshops than I can remember - and NEVER had "tilings" as the class! Maybe some day! Your quilt is incredible! Thanks for sharing! I was reading about 5 point stars at another blog recently. I enjoyed reading your post very much and might try making some soon. A wonderfully graphic quilt. 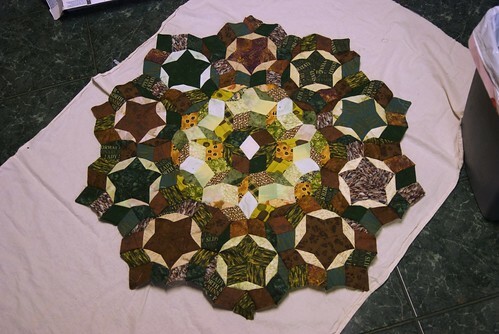 Some years ago we had a man join our quilting group and he was also using the penrose as his inspiration. What an incredible quilt design. And it's wonderful to think about how it is all based on such unique tile designs. Very impressive! Beautiful quilt and a woderful (educational) story. Your Penrose quilt is fascinating- I have long been interested in quilt designs that are based on math - My husband loves math and we have looked at ways to make a fibonnaci sequence or a quilt with a golden ratio - Penrose tiles and fractals are other kinds that I have tried to get my head around. Now before you think I might be totally crazy or a math freak or both I will just let you know that I love symettry in quilts but I am very mathematically challenged. I also don't design my own quilts or have EQ. 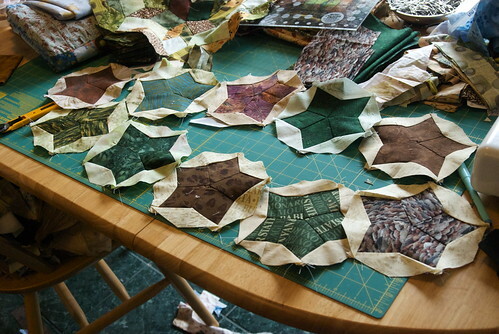 Still one day I hope to create a math quilt for my husband. I have long admired Jinny Beyer's work and had the good fortune to take a symettry workshop from Ruth McDowell . My husband loved your design and commented on how cool the tiling was- Golden Ratio and Penrose tiles have fiveness in common- the pentagrams are central to fibonnaci math. I think your new quilt design is glorious- I will look forward to seeing your design in fabric- I can visualize in some gorgeous batiks- it would be totally stunning. Thanks for letting me drool and ponder about your design. Wow, what an interesting design, I've come across the individual elements done as repeated blocks but haven't seen them combined in this central medallion type setting. Very dynamic. Thanks for the educational and inspirational post. Wow, what a beautiful quilt. Wow, what a beautiful quilt. Thanks for the educational post about it! Wow! This is beautiful. And, kudos to you for giving it away. I don't know that I would have been able to! I'm adding this to my "future project" list! I'm kind of a math geek, but fairly new to quilting. So I hadn't yet thought to tackle something quite this intricate. What can I say but WOW. That is really fabulous. I have always wondered what making a quilt inspired by M.C. Escher would look like, but have yet to get the idea out of my head and onto paper. Maybe you could help? FYI - for everyone who has subscribed to comments, I apologize if there was a delay in your comment appearing. I have been home sick from work the past few days, and she who has a 101° fever isn't thinking about comments on her blog. Sorry about that. Maybe now I shouldn't feel so silly taking photos of Tokyo subway flooring. great quilt. a lot of work to make it turn out so lovely! thanks for sharing and have a great day. I just love this quilt and the math behind it! I really want to make one as a gift to co-worker for his expected baby. But at the same time I am totally freaked out by how hard it must be to piece. Any tips you can give on piecing this would be fantastic. Thanks!